Welcome to another Tutorial Tuesday! 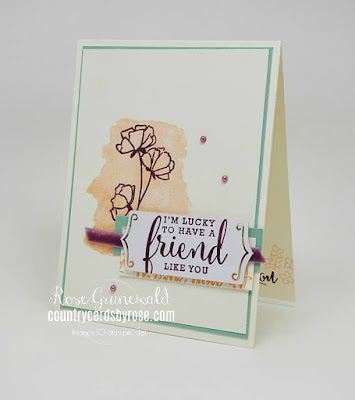 Today I'm featuring the EARLY RELEASE Share What You Love bundle with a super pretty card. Everything you need to make this card is included in the "A Little More, Please" bundle option. There are SO many options with this suite, and I'll prove it by sending you my own bundle...of CARD TUTORIALS! You can get 20 card tutorials or 50 depending on which Share What You Love bundle option you choose. Get more details on my blog post about the early release HERE. 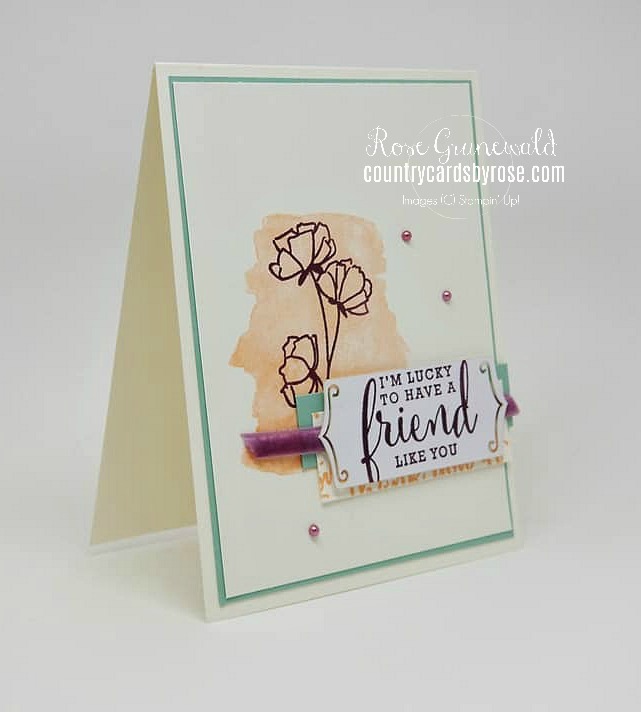 Follow my step-by-step instructions below to make this card. You can get a more printer-friendly version of this tutorial HERE. 1. Stamp watercolor wash in Grapefruit Grove ink. 2. Stamp flowers in Rich Razzleberry ink over stamped watercolor wash.
3. Stamp Thank You in random/reapeated stamp pattern over Very Vanilla Scrap in Grapefruit Grove ink. 4. Stamp “friend” sentiment in Rich Razzleberry ink on laser cut tag from Embellishment Kit. 5. 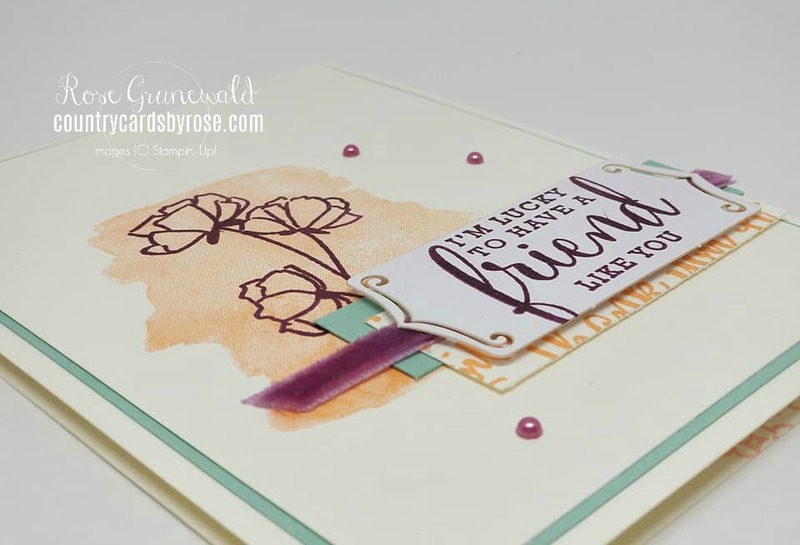 Using Snail adhere stamped Vanilla layer to Mint Macaron layer and adhere to card base. 6. Using Snail adhere scrap of Mint Macaron, stamped Vanilla scrap, and then velvet ribbon to card front. Snip ends of Mint Macaron and stamped vanilla scrap to length desired. 7. 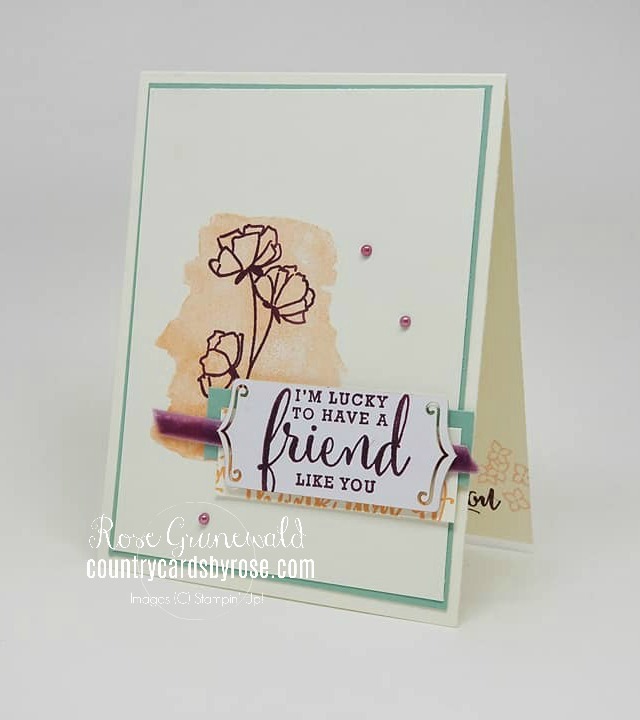 Using dimensionals, adhere stamped tag from Embellishment kit to over top of scrap layers. 8. Place Artisan Pearls on card front as shown above. Also - when you order from me, you are invited to my PRIVATE Facebook group for my VIPs. You can click below to go directly to my online store.